NOTE: Registration is now closed but you will have the opportunity to register onsite this Monday, November 16! Light hor d'oeuvres will be served. The Corporate Mixer provides companies the opportunities to access, recruit, and network with premier minority engineering talent. Dozens of top companies in the Washington area are currently seeking highly qualified, early career, mid-career, and seasoned technical professionals and will be conducting on-site interviews to fill available positions. Stay tuned for more announcements of confirmed companies attending the Corporate Mixer! Please submit your resume to the following link: https://nsbedc.recruiterbox.com/jobs/fk0h89a by Thursday, November 12 for pre-screening by attending companies! 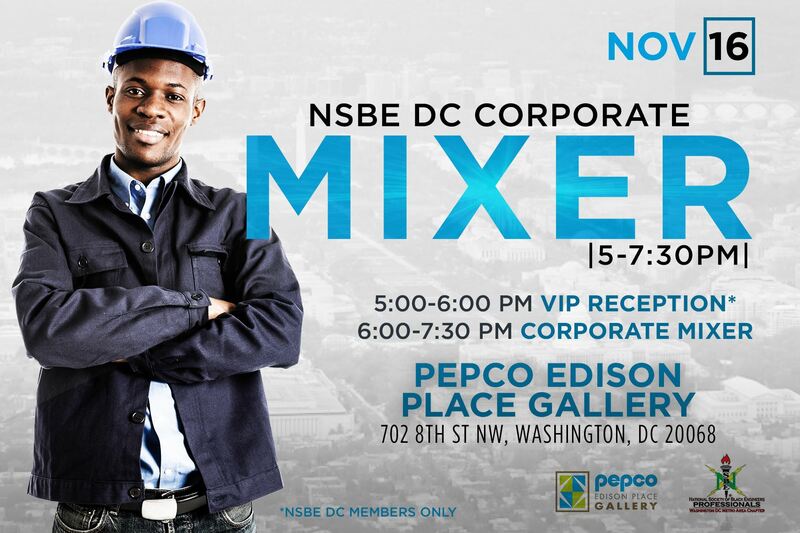 The Pepco Art Gallery is located at 701 9th Street NW, Washington, DC 20068. Note: The Entrance is at 702 8th Street between G and H streets, directly behind the entrance to Pepco's headquarters. 2015 NSBE DC Corporate Mixer! Please direct all questions to our Professional Development Chair, Shelton Liddell, at professionaldevelopment@nsbedc.org.